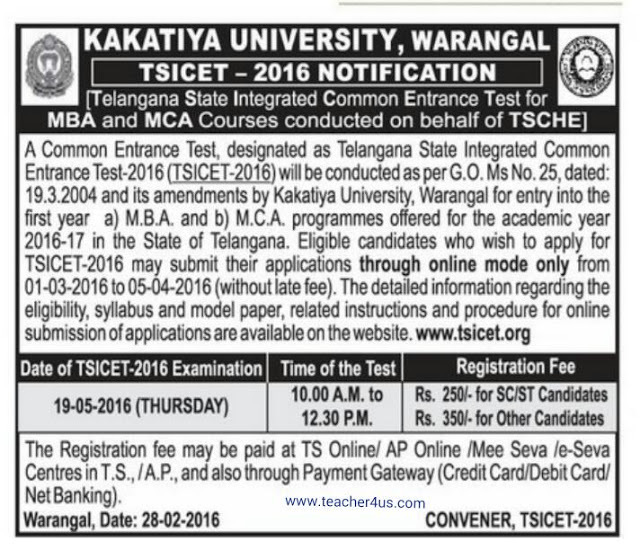 TS ICET 2016 Notification Online Application Telangana :The telangana state/TS Integrated Common Entrance Test ICET for admission into MBA and MCA programmes will be held May 19th.The results will be declared on May 31st 2016..The schedule of TS ICET 2016 was released on 25.02.2016,after the TS ICET 2016 committee met at Telangana State Council of Higher Education(TSCHE) in Hyderabad. Application forms can be submitted Online from March 1st to April 5th.The notification will be issued on February 28th.The registration fee is Rs 350 for general candidates Rs 250 for SC/ST candidates.The last date for registration is April 16th and with a late fee till May 16th.Hall Tickets can be download from April 29th onwards. Preliminary key will be released on on May 21st. How to Apply: Eligible candidates who wish to apply for TSICET 2016 may submit their applications through online mode only from 01-03.2016 to 05-04-2016.